3 Things YOU MUST KNOW About Your Husband! Over those years I’ve learned a lot about Mike. Sometimes I can even guess what he’s thinking. But there are still times that I can’t figure out what Mike wants. In those moments I fail to love him as well as I would like. Turns out that’s pretty common for most couples. 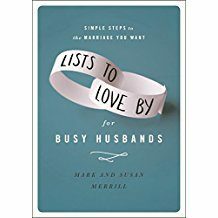 and for your man… Lists to Love By for Busy Husbands. Each book has 30 short lists included with next steps questions at the end. These books are so practical and doable. When we first started having kids, my husband, Mark was sometimes critical of me. It seemed like every week his criticism would change, and I always felt as if I was failing to meet his expectations. We could not resolve our problem on our own and invested in marriage counseling. It was one of the best investments we have ever made. Our counselor was able to objectively identify clear solutions to our problem. We needed to be realistic about our needs and expectations. The counselor was able to identify what was really important for Mark. She had him rank all the things he had asked of me over the years. Then she asked if there was just one thing that I could execute well for him during this busy season of young children, what would it be? He chose physical intimacy. Physical intimacy is Mark’s love language. So I started giving him more of that, and it worked. He was able to let other things go. It is not easy to understand your spouse. Becoming one is an ongoing process. I needed to know Mark’s priority, and Mark needed to understand my limitations. In this list, you will find six things you must know to better understand your husband. Gary Chapman’s classic book The 5 Love Languages: The Secret to Love That Lasts explains how we receive and “hear” love in different ways: receiving gifts, quality time, words of affirmation, acts of service, and physical touch. Which of these say, “I love you” to him the most? And remember that he may be using the same style to communicate his love to you, without realizing you may “hear” it differently. Perhaps he is telling you he loves you in ways you miss. In his book Wild at Heart, John Eldredge says every man wants an adventure to live. What is your husband’s? Does he long to start his own business or scale the highest peak on every continent? Has he buried his deepest desires in the duty of everyday responsibilities? Are there some ways you can help reawaken or encourage him in reaching for a brave goal that will stretch his faith? Mikes love language is words of affirmation! I am not always great at it but I try to take a step and meet that love language at least once each day! These books could literally save your marriage! 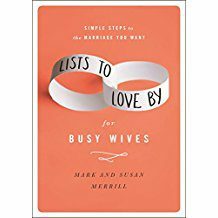 You can get Susan’s book, Lists to Love By for Busy Wives and her husband’s book, Lists to Love By for Busy Husbands here. The books also make a great couples or small group study resource for you and your friends. And, check out their free Lists to Love by 30 Day Marriage Challenge printable. In the meantime–leave a comment below telling me YOUR HONEY’S LOVE LANGUAGE and I’ll enter your name in a Friday giveaway for one of these great books! And don’t forget to Live UnStuck! Previous Post: « Free Friday! Yah! 14 Day Romance Challenge Winner! We’ve been married for 20+ years and I’m not sure what my honey’s love language is. How do I find out? Pat, Thanks for the chance to win the books. Julie, be sure to go to the website of the book! I think they have a free download! We have been married 36 years in June & I am sure Chuck’s love language is “acts of service”. He is a really good handy man, & every weekend he has more projects than he can get done. Mine is quality time, which he leaves little extra time to share. I would like to have the book for husbands “Lists to Live By”. Thanks.